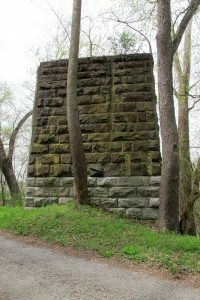 The Cumberland Valley Railroad (CVRR) was chartered in 1831 and began travel in Pennsylvania in 1835. It eventually expanded to Virginia, Maryland, and West Virginia. During the Civil War, the railroad supplied Union troops in the Shenandoah Valley, and later ran the first passenger sleeping car in the U.S. The CVVR’s first bridge across the Potomac, built in 1873, was a 1,000-foot timber truss-covered bridge with an iron roof. The bridge was flooded twice, and though a new metal-through truss bridge was raised 15 feet higher, it was eventually replaced in 1914 by a new bridge just upstream. This new bridge is now used by the Winchester and Western Railroad. Regular passenger train service on the CVRR ended in 1952.